Virginia is an employment-at-will state; its economy has diverse sources of income, including local and federal government, military, farming and business. Virginia has 4.1 million civilian workers, and one-third of the jobs are in the service sector. The unemployment rate in Virginia as of 2018[update] is 2.9%, which is below the national average. The second fastest job growth town in the nation is Leesburg, as of 2011[update]. The Gross Domestic Product of Virginia was $492 billion in 2016. According to the Bureau of Economic Analysis, Virginia had the most counties in the top 100 wealthiest in the United States at sixteen counties based upon median income in 2007. Northern Virginia is the highest-income region in Virginia, having six of the twenty highest-income counties in the United States, including the two highest as of 2008[update]. According to CNN Money Magazine the highest-income town in the nation is Great Falls, as of 2011[update]. According to a 2013 study by Phoenix Marketing International, Virginia had the seventh-largest number of millionaires per capita in the United States, with a ratio of 6.64%. Virginia is the largest producer of seafood on the East Coast, with scallops, oysters, blue crabs, and clams as the largest seafood harvests by value, and France, Canada, and Hong Kong as the top export destinations. Eastern oyster harvests have increased from 23,000 bushels in 2001 to over 500,000 in 2013. Wineries and vineyards in the Northern Neck and along the Blue Ridge Mountains also have begun to generate income and attract tourists. Virginia has the fifth-highest number of wineries in the nation. Located at the confluence of major bridges, roads, bus lines, and subway lines, Rosslyn station in Arlington is the biggest choke point of the Washington Metro system. Arlington accounts for 40% of Virginia's public transit trips. Virginia has Amtrak passenger rail service along several corridors, and Virginia Railway Express (VRE) maintains two commuter lines into Washington, D.C. from Fredericksburg and Manassas. VRE is one of the nation's fastest growing commuter rail services, handling nearly 20,000 passengers a day. The Washington Metro rapid transit system serves Northern Virginia as far west as communities along I-66 in Fairfax County, with expansion plans to reach Loudoun County by 2017. Major freight railroads in Virginia include Norfolk Southern and CSX Transportation, the former of which is headquartered in Norfolk. Commuter buses include the Fairfax Connector and the Shenandoah Valley Commuter Bus. The Virginia Department of Transportation operates several free ferries throughout Virginia, the most notable being the Jamestown-Scotland ferry which crosses the James River in Surry County. ^ Society, National Geographic (January 3, 2012). "United States Regions". ^ "Old Dominion". Encyclopedia Virginia. ^ a b c "QuickFacts Virginia; UNITED STATES". 2018 Population Estimates. United States Census Bureau, Population Division. February 1, 2019. Retrieved February 1, 2019. ^ "About the General Assembly". Website: Virginia General Assembly. State of Virginia. Retrieved June 5, 2013. ^ a b Somashekhar, Sandhya (March 4, 2008). "Government Takes Top Honors in Efficiency". The Washington Post. Retrieved March 11, 2008. ^ "2000 Census of Population and Housing" (PDF). United States Census Bureau. April 2004. p. 71. Retrieved November 3, 2009. ^ "Supreme Court Rules for Virginia in Potomac Conflict". The Sea Grant Law Center. University of Mississippi. 2003. Retrieved November 24, 2007. ^ "Fact Sheet 102–98 – The Chesapeake Bay: Geologic Product of Rising Sea Level". United States Geological Survey. November 18, 1998. Retrieved August 24, 2009. ^ "Virginia's Agricultural Resources". Natural Resource Education Guide. Virginia Department of Environmental Quality. January 21, 2008. Retrieved February 8, 2008. ^ Mayell, Hillary (November 13, 2001). "Chesapeake Bay Crater Offers Clues to Ancient Cataclysm". National Geographic Society. Retrieved March 11, 2016. ^ "Coal" (PDF). Virginia Department of Mines, Minerals, and Energy. July 31, 2008. Retrieved February 26, 2014. ^ "Comparison of Annually Reported Tonnage Data" (XLS). Virginia Department of Mines, Minerals and Energy. 2018. Retrieved April 9, 2019. ^ Hayden, Bruce P.; Michaels, Patrick J. (January 20, 2000). "Virginia's Climate". Department of Environmental Sciences. University of Virginia. Retrieved October 20, 2008. ^ "Report Card: Virginia". State of the Air: 2018. American Lung Association. April 17, 2018. Retrieved April 9, 2019. ^ Fahrenthold, David A. (June 25, 2008). "Debating Coal's Cost in Rural Va". The Washington Post. Retrieved November 15, 2008. ^ a b "Virginia's Forest Resources". Natural Resource Education Guide. Virginia Department of Environmental Quality. January 21, 2008. Retrieved February 8, 2008. ^ "Shenandoah National Park — Forests". National Park Service. July 25, 2006. Retrieved September 10, 2007. ^ "Species Information: Mammals". Virginia Department of Game and Inland Fisheries. 2008. Retrieved November 15, 2008. ^ "Shenandoah National Park — Birds". National Park Service. July 25, 2006. Retrieved September 1, 2007. ^ "Virginia Fishes". Virginia Department of Game and Inland Fisheries. 2008. Retrieved November 15, 2008. ^ "Virginia". National Park Service. 2008. Retrieved November 29, 2008. ^ "Park Locations". Virginia Department of Conservation and Recreation. November 9, 2007. Retrieved January 26, 2008. ^ Shapiro, Laurie Gwen (June 22, 2014). 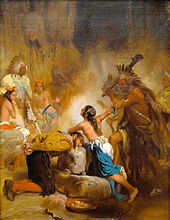 "Pocahontas: Fantasy and Reality". Slate Magazine. Retrieved June 23, 2014. ^ Kunkle, Fredrick; Vogel, Steve (May 14, 2007). "President Bush Caps Celebration Of Success in Face of Adversity". The Washington Post. Retrieved November 11, 2009. ^ "Virginia Military Dead Database Introduction". Library of Virginia. Government of Virginia. 2009. Retrieved April 26, 2009. ^ Glanville, Jim. "16th Century Spanish Invasions of Southwest Virginia" (PDF). Reprinted from the Historical Society of Western Virginia Journal, XVII(l): 34–42,2009 . 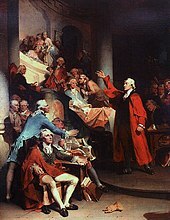 ^ "Signers of the Declaration (Richard Henry Lee)". National Park Service. April 13, 2006. Retrieved February 2, 2008. ^ Tripp, Steve. "Lynchburg During the Civil War". Encyclopedia of Virginia. Library of Virginia. Retrieved May 28, 2013. ^ Niemeier, Bernie (September 28, 2009). "Unique structural issues make progress in Virginia difficult". Virginia Business. Retrieved October 3, 2009. ^ a b Davis, Marc (January 31, 2008). "Chesapeake, Suffolk on track to pass neighbors in terms of population". The Virginian-Pilot. Retrieved October 20, 2008. ^ Somashekhar, Sandhya; Gardner, Amy (July 5, 2009). "To Be or Not to Be Fairfax County?". The Washington Post. Retrieved August 18, 2009. ^ Battiata, Mary (November 27, 2005). "Silent Streams". The Washington Post. Retrieved April 12, 2008. ^ "Annual Estimates of the Resident Population: April 1, 2010 to July 1, 2017". 2017 Population Estimate. United States Census Bureau. February 1, 2019. Retrieved February 1, 2019. ^ "Center Of Population Project". National Oceanic and Atmospheric Administration. 2000. Retrieved September 27, 2016. ^ Aisch, Gregor; Gebeloff, Robert; Quealy, Kevin (August 14, 2014). "Where We Came From and Where We Went, State by State". The New York Times. ^ a b c d "U.S. Census Bureau QuickFacts: Virginia". U.S. Census Bureau. 2018. Retrieved March 4, 2019. ^ Exner, Rich (June 3, 2012). "Americans under age 1 now mostly minorities, but not in Ohio: Statistical Snapshot". The Plain Dealer. Retrieved August 16, 2012. ^ "Scots-Irish Heritage – Virginia Is For Lovers". Virginia.org. 2011. Retrieved November 13, 2011. ^ "Virginia ranks highest in U.S. for black-white marriages". The Virginian-Pilot. ^ Wilder, Layla (March 28, 2008). "Centreville: The Gazette". Gazette. Retrieved February 15, 2016. ^ Wilder, Layla (August 1, 2015). "Centreville: The census". census. Retrieved February 15, 2016. ^ Wilder, Layla (March 28, 2008). "Centreville: The New Koreatown?". Fairfax County Times. Retrieved November 30, 2009. ^ Firestone, Nora (June 12, 2008). "Locals celebrate Philippine Independence Day". The Virginian-Pilot. Retrieved September 30, 2008. ^ Schulte, Brigid (November 23, 2007). "As Year's End Nears, Disappointment". The Washington Post. Retrieved June 25, 2008. ^ "Virginia". Modern Language Association. Retrieved August 20, 2013. ^ a b NW, 1615 L. St; Washington, Suite 800; Inquiries, DC 20036 USA202-419-4300 | Main202-419-4349 | Fax202-419-4372 | Media. "Religion in America: U.S. Religious Data, Demographics and Statistics | Pew Research Center". ^ a b c "The Association of Religion Data Archives | State Membership Report". www.thearda.com. Retrieved December 12, 2013. ^ Vegh, Steven G. (November 10, 2006). "2nd Georgia church joins moderate Va. Baptist association". The Virginian-Pilot. Retrieved December 18, 2007. ^ Boorstein, Michelle (March 10, 2014). "Supreme Court won't hear appeal of dispute over Episcopal Church's property in Va". The Washington Post. Retrieved May 1, 2014. ^ Walker, Lance. "USA-Virginia". Mormon Newsroom. The Church of Jesus Christ of Latter-day Saints. Retrieved August 19, 2017. ^ "Virginia facts". National Geographic. April 2, 2008. Retrieved April 12, 2008. ^ "Virginia State Unemployment Rate and Total Unemployed". Department of Numbers. July 2017. Retrieved December 22, 2018. ^ "Best Places to Live 2011 – Top 25: Fastest job growth – from MONEY Magazine". CNN. July 14, 2010. Retrieved February 18, 2012. ^ Matt Woolsey, America's Richest Counties, Forbes.com, 01.22.08, 6:00 p.m. ET Forbes.com Web site. Retrieved on February 8, 2008. ^ "Best Places to Live 2011 – Top 25: Biggest earners – from MONEY Magazine". CNN. July 14, 2010. Retrieved February 18, 2012. ^ Frank, Robert (January 15, 2014). "Top states for millionaires per capita". CNBC. Retrieved January 25, 2014. ^ Vogel, Steve (May 27, 2007). "How the Pentagon Got Its Shape". The Washington Post. Retrieved April 21, 2009. ^ Helderman, Rosalind S. (May 6, 2010). "Virginia's love-hate relationship with federal spending". The Washington Post. Retrieved May 26, 2010. ^ a b Ellis, Nicole Anderson (September 1, 2008). "Virginia weighs its dependence on defense spending". Virginia Business. Retrieved May 26, 2010. ^ Fox, Justin (February 8, 2007). "The Federal Job Machine". Time. Retrieved November 7, 2007. ^ "Bob McDonnell says Virginia is No. 1 state in veterans per capita". Richmond Times-Dispatch. ^ "Virginia Finally Comes Into Play". CBS News. October 17, 2008. Retrieved October 20, 2008. ^ "Virginia Transportation Modeling Program". Virginia Department of Transportation. ^ "Salaries of Virginia state employees 2012–13". Richmond Times-Dispatch. June 30, 2013. Retrieved May 1, 2014. ^ "State Exports from Virginia". census.gov. United States Census. Retrieved July 23, 2016. ^ Soldner, Allan (August 8, 2014). "Virginia has the Fastest Internet Speed within the US, Report Shows". The Week. Retrieved August 8, 2014. ^ Bacqué, Peter (December 13, 2013). "Va. Power certifies West Creek as potential data center site". Richmond Times-Dispatch. Retrieved February 25, 2014. ^ Rareshide, Michael. "Top 10 Largest Data Center Markets in the United States". ^ Dolan-Del Vecchio, Erik. "Largest U.S. Data Center Markets Continue To Boom". Bisnow Media. ^ Badenhausen, Kurt (November 28, 2018). "The Best States for Business 2018". Forbes. Retrieved April 9, 2019. 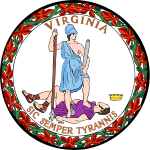 ^ "Top States 2018: Virginia". CNBC. July 10, 2018. Retrieved April 9, 2019. ^ "Best and Worst States for Business Owners". Fundivo. August 27, 2014. ^ "Virginia's Fortune 500 list grows". Virginia Business. June 8, 2017. Retrieved April 7, 2019. ^ Clabaugh, Jeff (September 4, 2013). "Virginia tourism sets record". Washington Business Journal. Retrieved September 5, 2013. ^ McNatt, Linda (October 17, 2007). "Tomato moves into the top money-making spot in Virginia". The Virginian-Pilot. Retrieved October 18, 2007. ^ "Virginia" (PDF). 2007 Census of Agriculture. United States Census Bureau. July 17, 2009. Retrieved October 6, 2009. ^ a b "Governor McAuliffe Announces Creation of Virginia Oyster Trail". Office of the Governor. ^ McBryde, John (January 21, 2015). "Virginia's Bountiful Seafood Harvest". ^ a b "Assessment of the Profitability and Viability of Virginia Wineries" (PDF). MKF Research LLC. Virginia Department of Agriculture and Consumer Services. June 2007. Archived from the original (PDF) on June 11, 2008. Retrieved June 26, 2008. ^ "About the United States Wine and Grape Industry". National Association of American Wineries. ^ Kirkpatrick, Mary Alice. "Summary of Jurgen: A Comedy of Justice". Library of Southern Literature. University of North Carolina. Retrieved August 18, 2009. ^ Lehmann-Haupt, Christopher (November 2, 2006). "William Styron, Novelist, Dies at 81". The New York Times. Retrieved August 18, 2009. ^ Dirda, Michael (November 7, 2004). "A Coed in Full". The Washington Post. Retrieved October 3, 2009. ^ Jackman, Tom (May 27, 2012). "Fairfax native Matt Bondurant's book is now the movie 'Lawless'". The Washington Post. Retrieved May 28, 2012. ^ Fain, Travis (June 27, 2014). "Gov. taps new OIG, elections chief, hires House member". Daily Press. Retrieved July 9, 2014. ^ Rice, Ruth (November 27, 2006). "Holiday magic: Arcadia play tells tale of Christmas poem". The Tribune-Democrat. Retrieved July 7, 2010. ^ "The Roots and Branches of Virginia Music". Folkways. Smithsonian Institution. 2007. Retrieved January 29, 2014. ^ Pace, Reggie (August 14, 2013). "12 Virginia Bands You Should Listen to Now". Paste. Retrieved January 29, 2014. ^ Dickens, Tad (June 3, 2014). "Old Dominion country band has Roanoke Valley roots". The Roanoke Times. Retrieved April 8, 2019. ^ Meyer, Marianne (June 7, 2007). "Live!". The Washington Post. Retrieved November 7, 2008. ^ "Local Television Market Universe Estimates" (PDF). September 12, 2013. Retrieved February 26, 2014. ^ "USA Today posts small circulation gain as it undergoes a revamp to counter Internet threat". Reading Eagle. Associated Press. April 20, 2011. Retrieved April 20, 2012. ^ "Monticello and the University of Virginia in Charlottesville". UNESCO. October 15, 2008. Retrieved October 14, 2008. ^ "Virginia Earns a B-Minus on State Report Card, Ranks Tenth in Nation". Education Week. September 5, 2018. Retrieved March 16, 2019. ^ "Virginia School Report Card". Virginia Department of Education. 2007. Retrieved February 2, 2008. ^ Connors, Mike; Gregory, Sara (October 1, 2018). "Graduation rates inch up around Virginia; some Hampton Roads divisions see improvement". The Virginian-Pilot. Retrieved March 16, 2019. ^ "State Report Cards". Virginia Department of Education. 2018. Retrieved May 1, 2011. ^ "Public School report" (CSV). Virginia Department of Education. 2018. Retrieved March 16, 2019. ^ Lombard, Hamilton (December 17, 2018). "Virginia's school enrollment declined in 2018 for the first time in decades". Weldon Cooper Center for Public Service. Retrieved March 16, 2019. ^ "Governor's School Program". Virginia Department of Education. 2019. Retrieved March 16, 2019. ^ a b "College Navigator — Search Results". National Center for Education Statistics. United States Department of Education. 2019. Retrieved March 16, 2019. ^ "Top Public National Universities 2019". U.S. News and World Report. September 9, 2018. Retrieved March 16, 2018. ^ "Best Art Schools". U.S. News and World Report. 2016. Retrieved March 16, 2019. ^ "Regional Universities South Rankings". U.S. News and World Report. September 9, 2018. Retrieved March 16, 2019. ^ Mattingly, Justin (December 20, 2018). "'We were no different': Virginia Military Institute integrated 50 years ago". Richmond Times-Dispatch. Retrieved March 16, 2019. ^ "SWCC Presidential Profile" (PDF). Virginia's Community Colleges. September 17, 2017. Retrieved March 16, 2019. ^ Hayes, Heather B. (December 31, 2018). "Teaching outside the box". Virginia Business. Retrieved March 26, 2019. ^ Szabo, Liz (May 12, 2004). "America's first 'test-tube baby'". USA Today. Retrieved February 6, 2008. ^ a b c "Virginia". America's Health Rankings 2013. United Health Foundation. Retrieved August 28, 2014. ^ Kumar, Anita (August 4, 2009). "Infant Mortality in Virginia Falls to All-Time Low". The Washington Post. Retrieved August 4, 2009. ^ "Va. restaurant owners bracing for smoke ban". The Washington Times. Associated Press. November 30, 2009. Retrieved May 6, 2011. ^ "Quick Facts". American Human Development Project. Social Science Research Council. 2012. Retrieved January 19, 2012. ^ "Hospital Compare". United States Department of Health and Human Services. December 11, 2010. Retrieved April 12, 2011. ^ "Metro considers building 'inner loop' of new stations to ease congestion in system's core". The Washington Post. ^ O'Leary, Amy A. (April 1998). "Beyond the Byrd Road Act: VDOT's Relationship with Virginia's Urban Counties" (PDF). Virginia Department of Transportation. Retrieved October 3, 2009. ^ "Virginia's Highway System". Virginia Department of Transportation. February 13, 2018. Retrieved March 16, 2019. ^ Mummolo, Jonathan (September 19, 2007). "A Ranking Writ In Brake Lights: D.C. 2nd in Traffic". The Washington Post. Retrieved March 29, 2008. ^ Badger, Emily. "The American decline in driving actually began way earlier than you think". The Washington Post. ^ Buske, Jennifer (October 14, 2010). "VRE sets ridership record". The Washington Post. Retrieved April 12, 2011. ^ Hosh, Kafia A. (April 15, 2011). "Federal, Va. officials object to underground Metro station at Dulles airport". The Washington Post. Retrieved May 6, 2011. ^ "Ferry Information". Virginia Department of Transportation. December 4, 2007. Retrieved February 14, 2008. ^ "Airports". Virginia Department of Aviation. 2006. Retrieved April 12, 2008. ^ Ruane, Michael E. (December 17, 2006). "At Va. Spaceport, Rocket Launches 1,000 Dreams". The Washington Post. Retrieved September 10, 2009. ^ Hart, Kim (April 21, 2007). "Travel agency launches tourists on out-of-this-world adventures". The Seattle Times. Retrieved May 26, 2008. ^ Helderman, Rosalind S.; Jenkins, Chris L. (May 7, 2006). "Latest Budget Standoff Met With Shrugs". The Washington Post. Retrieved November 24, 2007. ^ "Virginia Courts In Brief" (PDF). Virginia Judicial System. May 5, 2009. Retrieved August 17, 2009. ^ a b Vozzella, Laura (April 23, 2016). "Shad Planking, a venerable Va. political confab, tries to reel in a new crowd". The Washington Post. Retrieved February 21, 2019. ^ Sweeney, James R. (1999). ""Sheep without a Shepherd": The New Deal Faction in the Virginia Democratic Party". Presidential Studies Quarterly. 29 (2): 438. doi:10.1111/1741-5705.00043. Retrieved March 31, 2008. ^ Eisman, Dale (October 25, 2006). "Webb, Allen court Hispanic, white-collar voters in N. Va". The Virginian-Pilot. Retrieved March 29, 2008. ^ Turque, Bill; Wiggins, Ovetta; Stewart, Nikita (February 13, 2008). "In Virginia, Results Signal A State in Play for November". The Washington Post. Retrieved September 29, 2008. ^ Craig, Tim (December 11, 2007). "Tensions Could Hurt Majority in Va. Senate". The Washington Post. Retrieved December 23, 2007. ^ Craig, Tim; Kumar, Anita (November 8, 2007). "Kaine Hails 'Balance' in New Political Landscape". The Washington Post. Retrieved November 7, 2007. ^ Helderman, Rosalind S.; Kumar, Anita (November 4, 2009). "GOP reclaims Virginia". The Washington Post. Retrieved November 4, 2009. ^ Lewis, Bob (November 10, 2011). "GOP claims Va. Senate majority after Dem concedes". The Boston Globe. Associated Press. Retrieved November 15, 2011. ^ "McAuliffe wins nailbiter Virginia governor's race". CBS News. November 6, 2013. Retrieved November 6, 2013. ^ a b Bycoffe, Aaron (November 6, 2013). "2013 Elections: Governor, Mayor, Congress". Huffington Post. Retrieved November 6, 2013. ^ Lavender, Paige (November 6, 2013). "Virginia Election Results: Terry McAuliffe Beats Ken Cuccinelli In Governor's Race". Huffington Post. Retrieved November 6, 2013. ^ Barakat, Matthew (November 7, 2017). "Virginia House up for grabs after Democrats' historic gains". The Seattle Times. AP. ^ Moomaw, Graham (January 4, 2018). "Del. David E. Yancey wins tiebreaker for key Virginia House of Delegates seat". Fredericksburg.com. ^ Kumar, Anita (November 5, 2008). "Warner Rolls Past His Fellow Former Governor". The Washington Post. Retrieved November 5, 2008. ^ "Baseball in Virginia". Virginia is for Lovers. 2011. Retrieved November 26, 2011. ^ "NASCAR in Virginia". Virginia is for Lovers. 2011. Retrieved November 26, 2011. ^ Sylwester, MaryJo; Witosky, Tom (February 18, 2004). "Athletic spending grows as academic funds dry up". USA Today. Retrieved August 16, 2010. ^ Brady, Erik (December 14, 2006). "Virginia town is big game central". USA Today. Retrieved February 6, 2008. 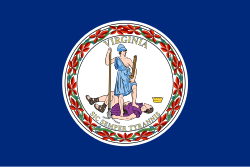 ^ "Listen: Virginia Now Has 2 State Songs". Patch. March 27, 2015. Retrieved July 29, 2015.